Defunct Audio Manufacturers L - audiotools.com. An USA mail order electronics retailer that also had large stores in some major cities, in the early day's mainly supplied electronic parts but later had a range of electronc goods including a range of products with their own brandname and with time the ration of own branded products did increase, but with the possible exception of some early radio models they are not believed to have made any these products themselves. In the 50's and 60's the Lafayette branded product where perceived to have been of at the least reasonable quality and often of a very good quality indeed but during the last years of the operation the products had by and large become the same budget Asian sourced stuff that everyone else was selling. Taken over by Radio Shack in the early 1970's and slowly integrated into that operation. Colloquially known as Lafy, note that there where a number of electronics manufacturers called Lafayette that where not related to this company. Originally Lahti was used as a brandname by Uolevi L. Lahti in the 1950’s for loudspeakers that he made at home and sold from his classical record store based in downtown Ann Arbor, Michigan, USA. But in the 1960’s he appears to have expanded the operation and/or changed into a hi-fi store and incorporated the business on the first of October 1964 under the above name. The company made quite a selection of loudspeakers through the years and had an excellent reputation locally but as far as we can gather never got any national distribution and seems to have been content with local sales and been more or less a one man band. The speakers made by the company were initially bookshelf models but later a variety of models appear including some funky globe style floor standing unidirectional speakers (see patent below) and a range of PA and commercial install speakers in addition to at the least one model of mid/close field studio monitors, noticeably some of the PA speakers are wide dispersal designs, but most models that you find on the second hand market that bear the Lahti name are two types of 2 way bookshelf speaker with the more oddball designs being very rare. Mr. Lahti was awarded a number of patents and applied for even more, most of them for loudspeakers related tech but also for electrical fixtures. The company was closed down in 1978 and dissolved in 1980, but Mr. Lahti moved to La Belle in Florida around that time and is believed that he continued to manufacture speakers there for the industrial and communications markets into the 1990’s but we have not been able to ascertain if that was as a sole trader or if he formed another company. US Patent 3,435,910 - Mr. Lahti’s spherical loudspeaker patent, this was only used in the PA/commercial sound speakers that he made rather than in home or studio loudspeakers AFAIK. US Patent 4,485,275 - This was used in some of his Florida era speakers from ca 1981 but not by the Ann Arbor outfit although a similar concept appears somewhat earlier in the unidirectional patent. Australian R&D company based in Sidney, New South Wales and originally founded in 1991 by Brian Conolly and David McGrathas as Lake DSP but changed its name to Lake Technology in 1999. The company originally supplied research and experimental tools based on technology from the Commonwealth Scientific and Industrial Research Organization that had been developed initially for use in radio astronomy and involved impulse and convolution technology that was at the time little known in the audio industry. The company did in the following years develop the Huron a modular multi-channel signal processing platform that was marketed towards sectors such as acoustic research, acoustic environment simulation and game development and it was from that product that the company developed what was to become Dolby Headphone (Now called Dolby Virtual Speaker) that for a time looked like it would become huge but turned out to be a short lived fad, by the turn of the century the company was making available a number of professional audio products both hardware and software including some unusual products such as audio convolution research systems and sold all kinds of development software and plugins much of them actually bought in from third parties, but also some hardware products. By 2005 all of the research and most licensing operations had been dropped and the company had instead focused on marketing their technologies into the installation and sound reinforcement fields and they introduced audio distribution and signal processing products that featured more advanced correction and analysis capabilities than had been available to that market segment previously. Lake technology was taken over by Dolby Laboratories in 2006 mostly to gain access to the patent portfolio of that Lake had amassed and to singal processing technology that was ahead of anything they had developed in-house, the sound reinforcement product line and lake trademark was then sold to LAB Gruppen in 2009. Loudspeaker manufacturer founded in 1979 in Auckland, New Zealand and run by Garry Lambert, an ex-PYE man. The company had for a time a number of interesting products on the market including a subwoofer built into a coffe table, studio monitors and PA speakers but was best known for its acoustic suspension designs intended for home usage. Lambert audio also did some OEM manufacturing for a number of smaller players including Tara Labs. Was closed down in 1995/6 as the trade liberalisation of the early 90's had made it difficult for smaller NZ makers to compete with their low wage Asian neighbours. Mr. Lambert went on to work for Perreaux, he has since been with Tara Labs and now runs Audéo. Lambert Audio minstrel 10 -- A review from 1991 by the same magazine. Founded by James Borgiono in the mid 60's and located in Westfield, New York, USA. The company made kits, most of them audio oriented, including a number of amplifier designs but also technical products like tone generators and suchlike. The company was sold to SWTP in 1971 and Mr. Borgiono went on to work for SAE and later founded a number of companies icluding GAS and Sumo, and he is now with Spread Spectrum Technologies. Small British manufacturer of valve amplifiers supplied mainly as PA equipment but also in the later years as hi-fi equipment, originally started by ex-Marconi engineer Gordon Lawson shortly after WWII as G. R. Lawson Ltd. but ran into financial difficulty at the turn of the decade and took on a partner named Parson and thus the new name. While the new company was initially somewhat successful it was always underfunded and was wound down in the latter half of the 50's when Lawson went to work for Beam-Echo Ltd..
British manufacturer of consumer audio products based in London. There is an interesting site that has info on the Leak company, but sadly the proprietor of that page seems to loose interest in the company when it starts developing transistor amps and no info on the company after it was bought by Thorn-EMI..
Company was started around 1949 by Bill Lear who was one of the original founders of Motorola, introduced a wire recorder in 1945 Lear-Jet based in Grand Rapids in the state of Michigan, U.S.A. .
Chinese manufacturer of loudspeakers, primarily for professional usage. The company is believed to have been founded in the early to mid-1990's and worked mostly as an OEM but also sold speakers under the RMAC brand. The company merged with Yuantian and the trading company Jin Qian Li to form Guang Zhou in 2002. Company based in Portland, Oregon, USA that manufactured mid end loudspeaker systems that featured a unique patented line source/wave bending tweeter that is also referred to by the Linaeum name, note that their trademark used a ligature, i.e. it was written Linæum rather than Linaeum like the company name. Run by Paul Paddock and Ben Stutz and was started up in 1983 as Intensity Inc., changing its name to Floating Membranes Inc. in 1986, to Lineaum Corporation and then finally to Linaeum Corp in 1989, note minor spelling difference, the earlier spelling is incorrect Latin. The company’s main claim to fame was the dipolar line source tweeter that has a theoretical 360° soundfield, its basic working principle is similar to a ribbon loudspeaker in that there is a magnet that excites a ribbon but in this case the ribbon is not a tiny metal foil but a rather large doped silk ribbon, bending wave transducer in other words rather than a true riibbon. Since the soundfield is so wide the tweeters were placed on top of the speakers in the more expensive models from the company, but cheaper models had a monopole unit that was placed in conventional position for a tweeter at the top of the speaker facing forward. Linaeum reached agreement with the Radio Shack corporation to license the technology to RS in 1995 or thereabouts, the outcome of that collaboration was the Linaeum designed Radio Shack Pro LX5 loudspeaker and the Optimus Dipole Tweeter, those 2 used a cheaper Linaeum driver built in Japan that had polypropylene for diaphragm material instead of silk and the actual speakers were manufactured in an RS controlled factory in Malaysia. These sold very well initially which lead to the company designing more models for RS including cheaper models and home theatre packages. The company was acquired in 1997 by Aura Sound, it was by then only producing a couple of models of speakers, Radio Shack continued to sell Linaeum designed speakers until 2003 but by that time they simply had stopped selling and the line was therefore dropped, there was a Toshiba speaker a couple of years later that used the same Japanese sourced version of the tweeter but that bombed in the market as well even though it was considered a better product than the RS ones, and was only available for a few months. Aurasond continued to manufacture the Linaeum tweeters for a few years but no longer offer them as a standard product, but use the monopole version in one or two of their home theatre loudspeaker models and offer them as a custom part for OEM's in both the dipole and monopole variants. Mr. Paddock later resurfaced with an improved version of the driver and a new company called Active Environments Research Organization in 2005 but that appears to have disappeared as well, and apart from the aforementioned Aurasound the only speaker that appears to use a similar wave bending technology is the Audio Consulting Rubanoide speaker features a driver based on a similar idea but with a much larger diaphragm. Spares & service : Any competent speaker repairer should be able to fix loudspeakers made by Linaeum, drivers are usually common models from companies like Vifa with fairly simple crossovers and the Linaeum drivers should be available from Aurasound as spares, the tweeters may not even need replacement, in case of failure it should be noted that they are actually very simple constructions that are easily fixed with the sole difficult to source part being the doped silk fabric. Radio Shack still listed replacement drivers for their version of the Linaeum driver until recently but current availability is unknown. Resources : -- Home Theaater Reviews .com’s review of the Linaeum LFX II -- Gramophone magazine reviews the LFX. Originally founded in 1946 as a partnership called Lennartz, H. und Boucke, H. Laboratory für Technik - Physik and then based in the Möhringen district of Stuttgart in Baden-Württemberg, West Germany. The company initially made unusual consumer radio receivers in association with Rondo_GmbH, these were called Zauberdose and sold under the Rondo brand and were basically simple radios with upwardly firing omnidirectional loudspeakers, that were housed in urns and vases made by the Gutenhalde Pottery which was owned by Willy Bürkle, but he was also the owner of Rondo. Initially the Zauberdose was considered by the radio press to be something of a novelty product but it actually was something of a hit in the marketplace and placed the LTP company on a sound financial footing. The company was incorporated a little later as a limited partnership (KG) and moved to nearby town of Tübingen, but the main motive behind the move appears to simply be the availability of suitable premises. In 1947 the company introduced more conventional radio receiver products and a small line of professional radio communication equipment using the initials LTP as a brand. Right from the founding of the company there was talk about a advanced consumer radio receiver design named "Die Zauberflöte" or "The Magic Flute" after the Mozart/Schikaneder opera, owner Dr. Herbert Lennartz had apparently been working on that design since the war years and had received patents for some aspects of its design. 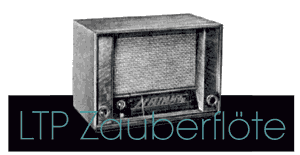 The Zauberflöte was considered more technically advanced than anything available on the market in 1946 and got quite a bit of anticipation and press on the radio scene. It was important to the business since before the war the mid and especially high end radios had been the staple of the radio business and the source of all the radio manufacturers profits, while the mass market and Volksempfänger radios had generated sales volumes they failed to generate any profits to speak of due to competition. While the Zauberflöte had been mentioned as early as 1946 and was expected to hit the market in 47 it did not actually ship until 1949, it is not know if there were technical issues with the implementation of the design or if in the aftermath of the second world war there were problems in sourcing high spec components. In the meantime the company released a small number of radios that featured simpler superheterodyne circuits and continued attempting to break into the commercial radio market. However disaster struck in early 1948 was shipped ten thousand vases from the Gutenhalde Potteries that were to small for the radios that were meant to go into them. This created friction between LTP and Rondo owner Willy Bürkle, with the latter accusing the former of having incorrectly specified the vases and terminating the contract he had with the company. As the Zauberdose was the main seller of the company and the Gutenhalde Potteries trying to chase down the company for payment of 10k vases that were of no use to them, LTP was effectively bankrupt. The company was bought by another Tübingen based company called Himmelwerk, and they changed its name to LTP Himmelwerk AG. Under the stewardship of Himmelwerk the company finally managed to release the Zauberflöte and a raft of updated consumer radios in 1949 that were sold branded as LTP but advertised as Himmelwek confusingly enough. Sales however were disappointing and as early as 1950 Himmelwerk started to move personnel and manufacturing equipment to the mother company, the production of the professional radio line was taken over by Himmelwerk and a number of LTP engineers were moved to a new sub-division that manufactured high frequency generators. This left the LTP company with only the consumer product line and with the limited sales it was decided to wind the company up in 1951. A company based in Bexhill on Sea, in Sussex, England that took over the manufacture of Lumley branded loudspeakers after the demise of Reference International. LL was formed in 1998 by John Jeffries but sales were slow so he decided to concentrate on his other 2 businesses, namely a high end audio store called Sounds-Of-Music and hi-fi distributor Metropolis Music. The company had stopped most manufacturing by 2000 and it was de-listed in 2002, however Metropolis Music retained the Lumley brandname and made a few pairs of loudspeakers in the following years. Founded in 1923 in Motala, Sweden by Axel Holstensson as Luxor Radio to manufacture crystal radio sets but quickly grew in to one of the larger Swedish radio manufacturers. Expanded into other areas of brown goods manufacture in the 1950's and became one of the first European mass manufacturers of television sets. Despite being small on an international scale and with marketing and distribution almost entirely limited to the north-western part of Europe, Luxor was actually a full line manufacturer, by 1976 the company not only sold a wide range of TV and hi-fi products including separates and high tech products like video recorders but also TV games and cheaper products like portable radios and suchlike, it had at the time a workforce of over 2600 and a turnover of more than 700 million SEK pr. annum. However disaster struck later that year when the company's TV manufacturing plant burnt to the ground, since TV production was by this time a mainstay of the company this was a blow from which it never really recovered as the increased competition in the market in the following years did not give it the necessary elbow room. In 1978 the company formed a new division called Luxor Datorer (Datorer = Computers) and introduced the ABC80, a Z80 based personal computer that became very popular in northern Europe and the first satellite TV set-top box. The ABC80 is intriguing since the only computer experience the company had prior to this was a very limited production run of terminals for SAAB (or DataSAAB rather) but nevertheless they made quite a success out of its manufacture by utilising their CE manufacturing know how and existing production facilities, for instance the monitor that came with the ABC80 was a modified portable TV and so on, this enabled the company to offer their computer products considerably cheaper than comparable imported items despite having a much smaller market and superior specifications, another factor was that the company also sold the computer through their existing dealer network but in most other countries computers where sold almost exclusively in computer and electronic stores rather than in electrical retailers. The company however hit cash flow problems in 1979 and was nationalised later that year. Luxor was reasonably successful under government control but mounting pressures from their competitors forced the Swedish government to get rid of the company and it was sold to Nokia in 1984 who merged the browngoods part of the operation with Salora which still uses the Luxor brand to sell their products in Sweden, the Luxor Datorer operation was closed down in 1986 but the set-top box manufacturing part of the operation survived.